This view of Bath shows in particular the medieval abbey church at the centre of the old town. During the 18th century, Bath became a fashionable pleasure resort and as such it was extensively rebuilt and renovated. The result was spectacular: the medieval city plan was replaced with an orderly series of squares, crescents and terraces. Dozens of elegant new townhouses were also built, and Bath became one of the most beautiful cities of its era. 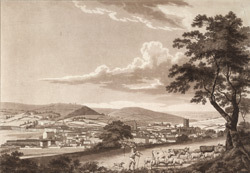 This 1793 view shows a much different cityscape than an earlier 1727 view by AB Lens. Rows of neat Georgian terraces can be seen spreading up the northern hillside that overlooks the old city. This hillside area became known as the New or Upper Town.